A Fujitsu Laboratories staffer demonstrates a glove-like wearable technology prototype that has a near field communication tag reader and gestural sensors. It works with a head-mounted display to speed up maintenance tasks such as cabling. 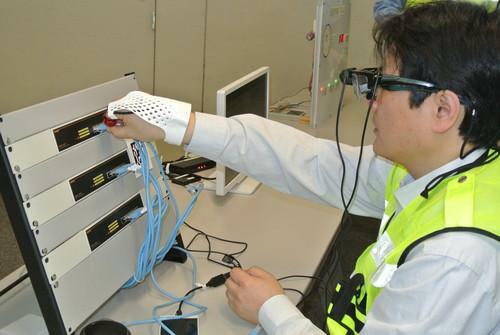 Fujitsu Laboratories has developed wearable technology in the form of a glove and a head-mounted display that could help speed up maintenance work and other applications where NFC tags are widely used. The glove has a NFC (near field communication) tag reader and works with gestures to input information and retrieve it for the head-mounted display. Used in many smartphones, NFC is a short-range wireless link that allows two devices or a device and an NFC tag to exchange data. Using the glove together with a head-mounted display, an operator can, for example, touch a connector or control panel's NFC tag to obtain specific installation instructions, then make a simple gesture to register the task's results. This is expected to streamline operations and cut errors. The glove is actually a mesh-like covering extending from the user's wrist to the index finger. The wrist area houses a gyro sensor, accelerometer, and an NFC tag-reading unit, while the finger portion has a tag reader and a contact-detection sensor. The glove can be linked via Bluetooth to a smartphone, which can query the cloud regarding NFC data from tags around the glove. The results are displayed on the user's head-mounted display, also linked to the phone via Bluetooth. The display can also be controlled via wrist movements. Fujitsu tests showed that six wrist movements could be recognized with 98 percent accuracy, and so gestures such as moving the hand left or right could be used to flip through pages in a work manual shown on the display. Workers won't have to pause to look at an instruction manual or smartphone display, seeing all the info they need on their head-mounted screen, according to Fujitsu. At a demonstration in Tokyo, a Fujitsu staffer used a prototype of the device to hook up cables to a mock server panel. He sat beside a screen showing a camera view of the contents of his head-mounted display, which overlaid cabling directions on his view of the panel. "We think the potential uses for this technology could be very wide-ranging," a Fujitsu spokesman said. "It may be possible to apply it in medical and welfare areas such as nursing care, or distribution-related areas such as merchandise handling in warehouses. We think this technology could contribute to the reduction of human error in such fields and allow for more effective, hands-free work." Since the NFC tag reader is activated only for the moment when an object is tapped, the device has a low-power profile. Its batteries can operate for up to nine hours at a time. Being long-lasting and not bulky, the glove is designed for field work such as maintenance jobs on servers where NFC tags could be used, according to Fujitsu. Fujitsu is eyeing commercialization of the glove in its fiscal year starting April 2015. Meanwhile it will continue to test the device, and will show it off at Mobile World Congress starting Monday in Barcelona, Spain.